The answer may lie in a completely new way of thinking about the solution—building societal platforms to address developmental challenges of the 21st century. Nandan Nilekani, the person responsible for India’s biometric unique ID program, or Aadhaar, unveiled this approach in an exclusive event at the Center for Global Development recently. He urged the development community to work collaboratively with those in the technological world to identify problems and implement solutions at scale. And the sooner, the better. 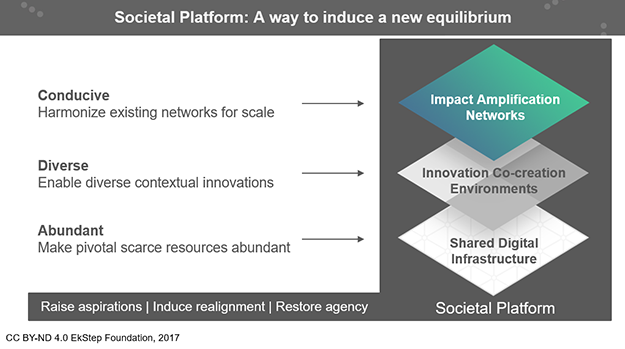 A societal platform is a public good built on three layers. The first is shared digital infrastructure, which enables and encourages a second layer of innovation. This is then amplified through the third layer, networks of individuals, communities and institutions. The shared digital infrastructure makes scarce resources abundant, such as teacher training, textbooks or clinical guidelines. The innovation and co-creation environment gives space for diversity of approaches and solutions—lesson plans in multiple languages, for example. Finally, the amplification network brings the resources and solutions to the millions whose education and health we seek to improve. A societal platform is open, scalable and inclusive. It is also agnostic to ideological positions about who should deliver these services or propose solutions. Learning networks, for instance, can consist of public and private schools, informal learning institutions and parents. More importantly, it approaches developmental challenges from a systems perspective and not just solving individual parts of the problem. “Think of this as one more way of enforcing the rules of the game,” Nilekani told the audience at CGD, as you can see in the video clip below. This is not just theory. There are already practical applications of this ‘solution architecture’ especially in India. The largest is, of course, Aadhaar itself. As Nilekani explained, Aadhaar was designed as an identification platform from the very outset, with the digital ID as the first layer. Starting from a clean slate, the number of digital IDs went from zero to 1 billion within a span of five years. Once the shared digital infrastructure—the first layer—was put in place, innovative applications emerged through the development of the “India Stack”. Nearly 200 million bank accounts were opened with electronic Know Your Customer (e-KYC) process, over 500 million accounts were linked to Aadhaar enabling the government to transfer subsidies such as cooking gas directly to the beneficiaries, and nearly 7 billion documents uploaded to the Aadhaar-linked DigiLocker. Linking accounts to the unique ID enables easy payments between accounts. This, according to Nilekani, is just the beginning. As people come on board in increasing numbers, innovations will flourish and networks will become stronger. It is also time to move beyond digital ID into other sectors, such as education, health and livelihoods. Already, an education platform created by EkStep is being used for teacher training in India on a national scale. It is also being adopted widely by sub-national governments for diverse applications such as lesson plans, energized textbooks, learning assessments and remediation. Creating societal platforms requires risk capital, since not all initiatives will succeed. While most digital platforms we use today, such as the internet and GPS, were largely publicly funded, societal platforms would require large scale mobilization of philanthropic investments in the long term. It will also have to provide incentives to unlock technical skills and investible capital from the private sector—making two critical scarce resources abundant. In the end, societal platforms are not about excluding market participants. It is about creating a level playing field for the private sector to become partners in solving the most important developmental challenges of our times. CGD recently co-conducted the first ever widespread survey of Aadhaar users in India. Watch for the results, coming soon!